CONTACTING SONY Sony has a customer service page including some useful information on video and still cameras, and other products. 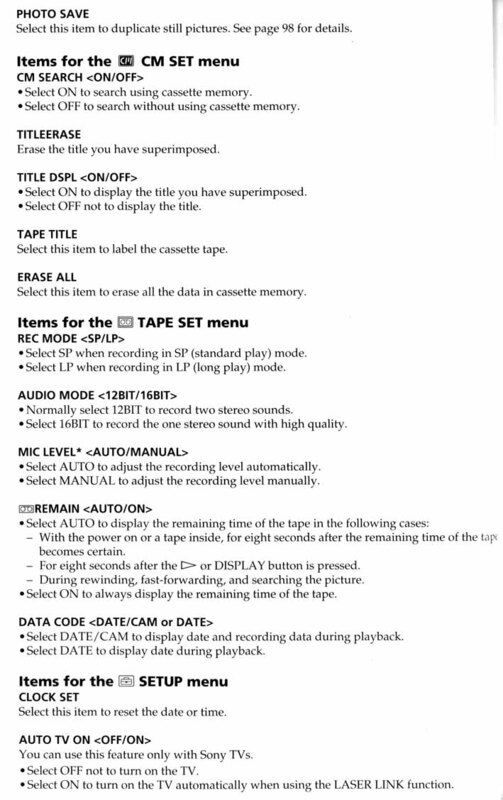 Sony also has their own MiniDV/Digital8 FAQ. If you have some question or issue that would be better addressed by Sony than by myself, you can contact them here. Sony USA Customer Information is at (800) 222-7669 or (941) 768-7669. For troubleshooting your equipment, call the Sony Digital Imaging Hotline at 1-888-449-7669 (hours-EST) M-F 8:30am-6pm, Sat 9am-6pm. The previous number is the Sony Consumer division: if you have a PD100 or PD150, you need to talk to the "Sony Professional" division which you can reach at 1-800-686-7669. You can send comments or feedback to Sony online at www.world.sony.com. 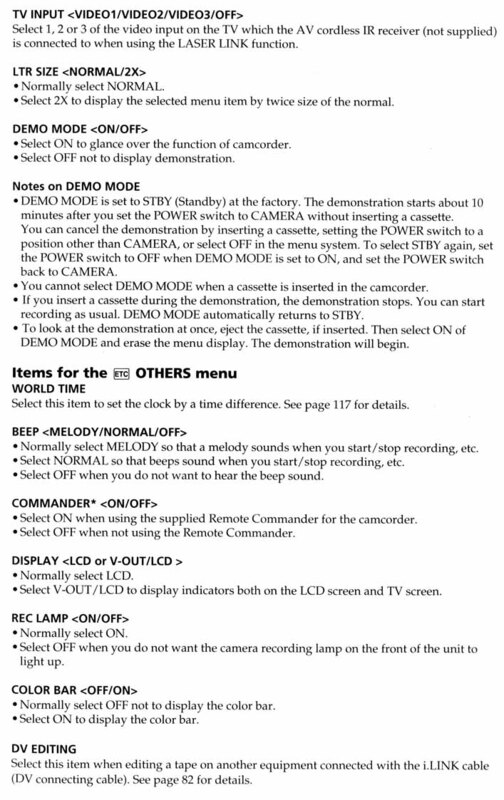 MANUALS: You can download the entire TRV900 User's Manual or TRV950 User's Manual online, and there are also other manuals at www.docs.sony.com. The TRV890/TRV900 Service Manual (58 MB PDF file) was at one time, and may still be available here. This website iq.sony.com has a selection of user's manuals. 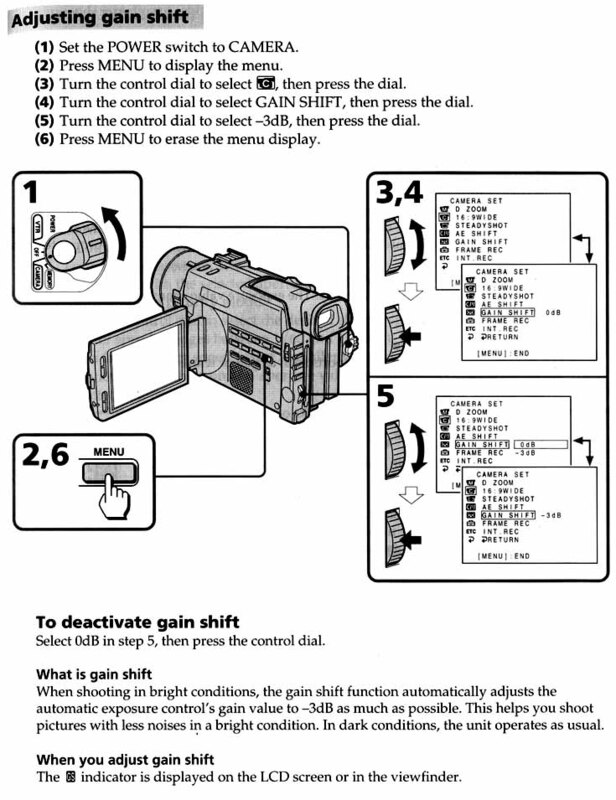 There is a wide selection of camera and camcorder manuals online at Henrys Photo, a Canadian retailer. 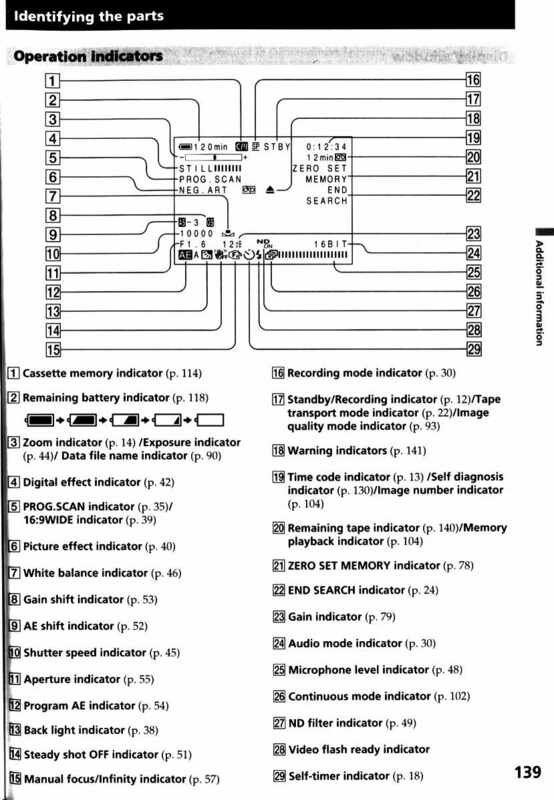 Paul Hutchinson contributed an improved index for the TRV900E (PAL) user's manual, here in Word RTF format and plain text. 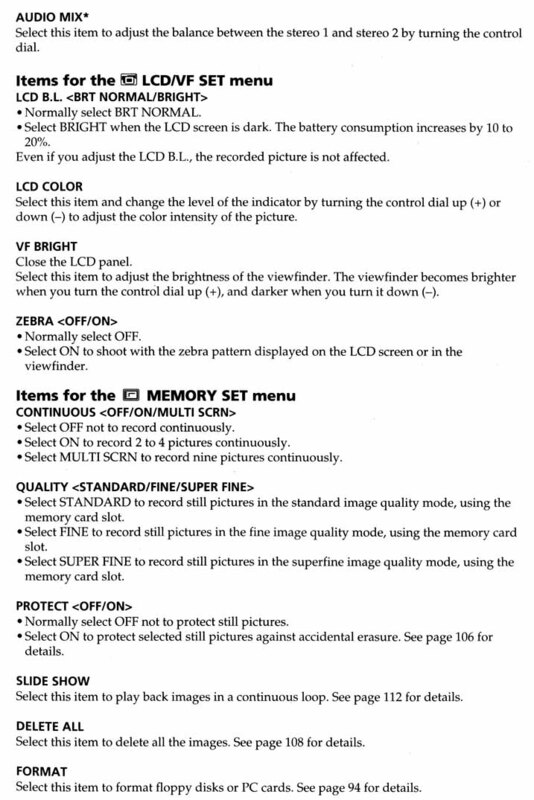 I scanned in a few pages from my DCR-TRV900 (NTSC) manual (3-864-632-11 (1) 1998) myself. 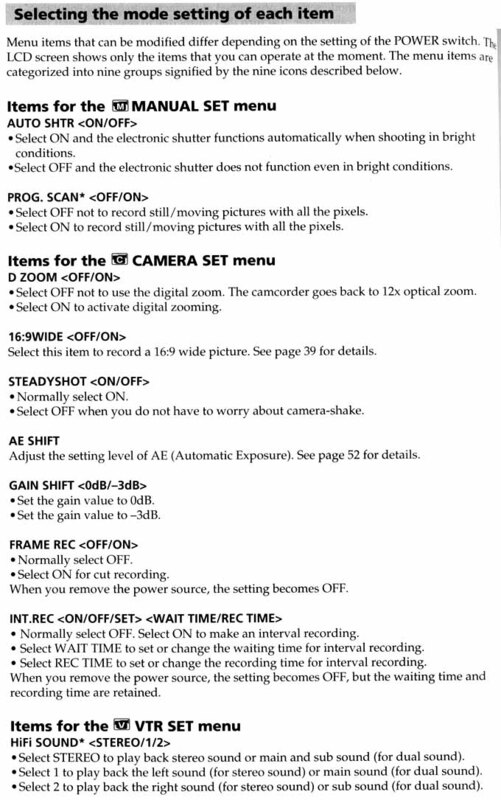 Here are the specs for the camera, the expected battery life, and the control menu selections (page 28-32 of the manual: 28, 29, 30, 31, 32). 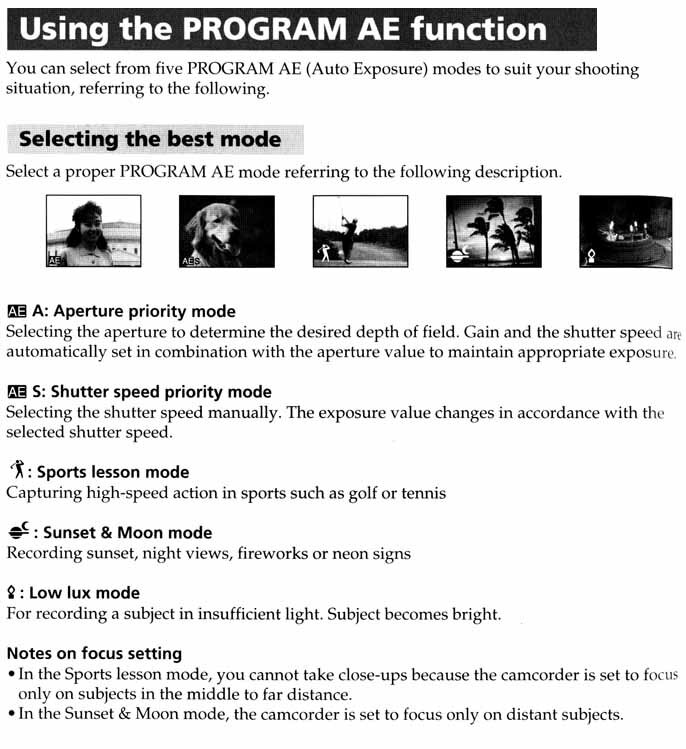 Also, AE shift, gain shift, and Program AE p.54, p.55. Here are the things you can see in the viewfinder. Note the viewfinder isn't really that cluttered, most of the time most of these annunciators aren't there. 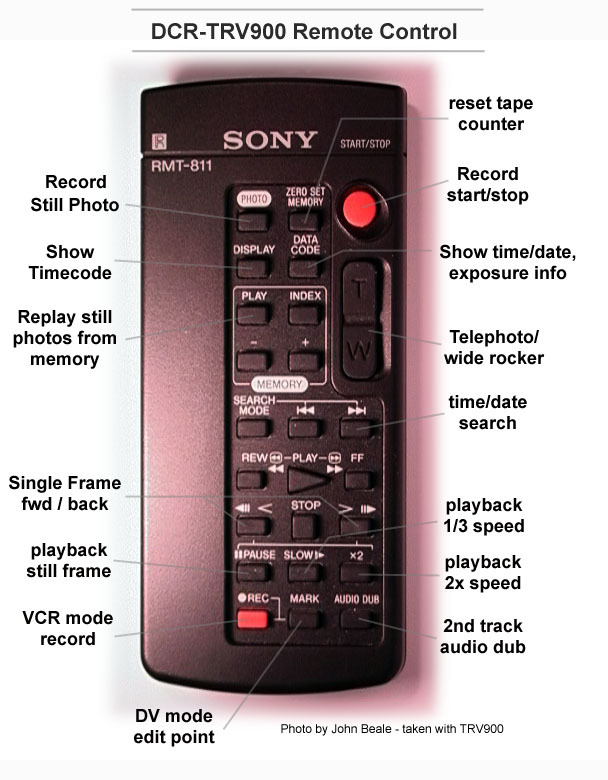 Here is a picture of the IR remote that comes with the camera, with the buttons labelled. 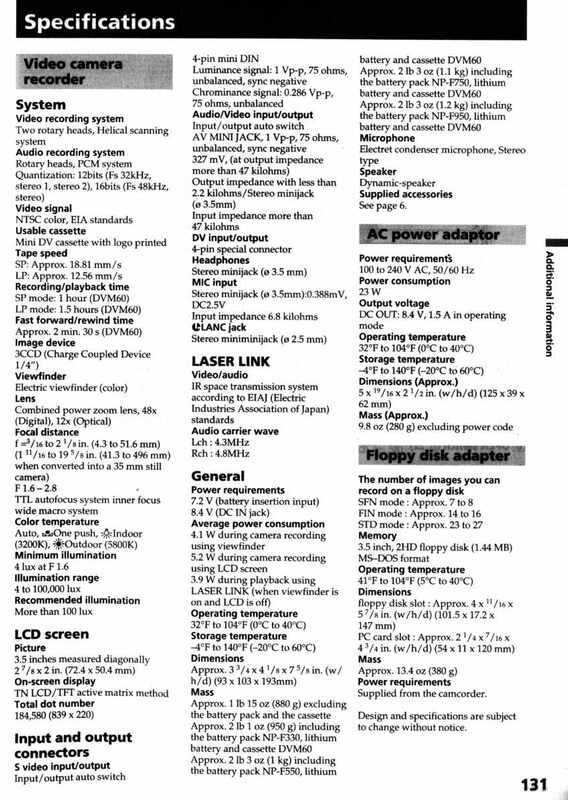 Here are a few scans from the service manual. 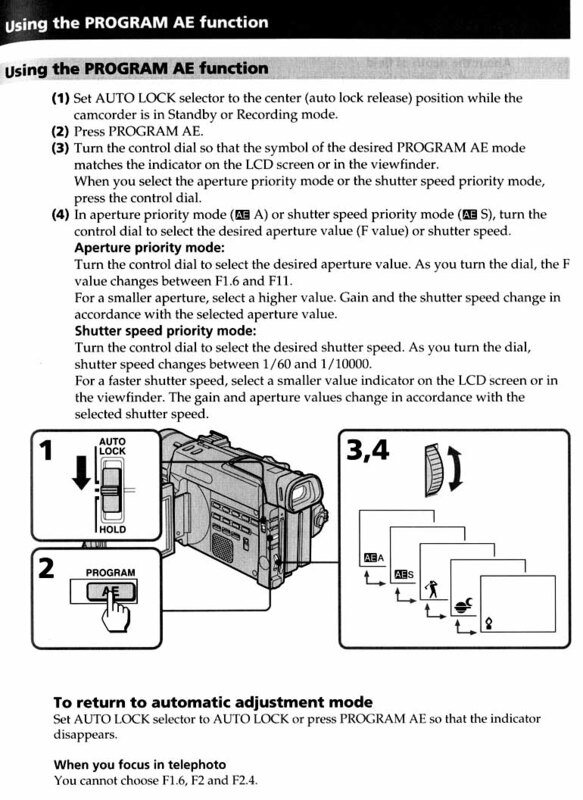 There are some pro equipment manuals from Sony Canada, covering Sony DVCAM equipment including the DSR-PD100 and PD150. REVIEWS: There is an excellent comparison of MiniDV camera images at this Japanese webpage, you don't really need to read the language, just click on the camera names for the images. David Ruether compares 11 different Sony, Panasonic, and Canon MiniDV camcorders (plus a Sony BetaSP) in a very useful set of reviews (including pictures) on his webpage. The folks at www.dv.com have a comparison review of 10 Firewire camcorders including the TRV900 and the PD100 online, it's a 600k PDF file. There is also a PC Magazine review of nine DV camcorders. Sound and Vision Magazine has an in-depth review specific to the TRV900. Go to their web site and search for the keyword TRV900 or try this link. They describe the camera operation from a user's perspective, and also present many lab tests and performance figures. There is some test data here comparing several MiniDVs and a Hi8 recorder, from the Swedish magazine "Ljud & Bild". Adam Wilt reviews the TRV900 at 2-pop.com. Michael Reichmann's Luminous Landscape webpage doesn't cover video, but his truly excellent reviews of high-end inkjet printers and digital still cameras, as well as beautiful photography, is well worth a visit. PHOTO SITES: For some stunning examples of what this camera can do, you need look no farther than Peter McLennan's page. Ron Co has a web page in Australia with some very good TRV900 still frame photos on it. Tri Tran has some great marine photos from his aquarium at his reef garden site. There are some TRV900E shots of Singapore here. Dacky Chan has an impressive array of flowers and other photos. Vincent has some more pictures including impressive close-up and 10x tele-extender(!) examples. Here is a collection of outdoor shots of castles, windmills etc. John Malm's page has some very nice photos of the SF Bay area. Tom Funk has posted some of his European vacation photos. Michael Klein has posted some nice pictures from Italy. Tim Davis has some beautiful work at his page from the TRV900 and Nikon CP950 (digital still) cameras. There are some very nice images online from Puerto Rico. Chris Martino has a nice collection of Japan photos mostly with the TRV900. Mark Goldberg's video production site has some TRV900 photos. The travel diary on this site has photos of Switzerland. There is another TRV900 page in France here with photos from a JVC GR-DV1 (note: in French). Here are some shots of high school football. Jon Black has some great images and animations of lightning. Andrew Nguyen has photos from his Vietnam vacation and other subjects on his homepage. Jim Maurer has hiking in Venezuela. Dwight Anderson has pics from Ft. Collins including an excellent double rainbow. Simon Plint has a global pan project. Mark Wilczenski has some nice island images, modified for a painting effect in Photoshop. Darshan has some well-lit and composed close-ups here. Karla Parussel has some very creative still-lifes this page. Brett Mensh has some TRV900 shots from New York on 9/11. Many readers have sent in some great images for my Contributions Page. USAGE NOTES, DV EDITING: Cliff (clifand at aol com ) posted this note about his experience using the TRV900 to film an outdoor festival and an indoor play. Nishka posted the first letters, and later I bought one myself and wrote some notes. Here is a letter from Truevision regarding the TRV900. 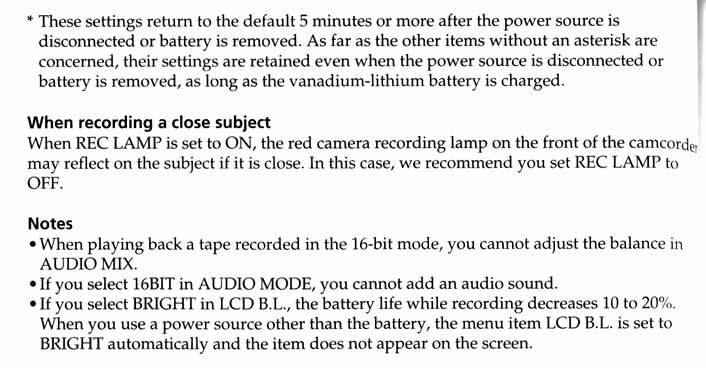 Here is some more DV2000 info and a note describing the GV-D900 "Video Walkman" which is a portable MiniDV VCR with firewire, allowing you to do linear video editing in the digital domain. DANGEROUS TAPE? Oct. 28 1998: There has been a discussion in rec.video.production about whether Panasonic DV tape can damage your Sony camera. From some reports, it has, but there is speculation that either Sony or Panasonic have improved their formulations since 1997. Others report no problem with Panasonic tape. It seems the problem is mixing the brands used. I've copied the most useful messages from the newsgroup so you can decide for yourself. (As recently as Summer 2001 there are still newsgroup reports of problems when switching MiniDV brands.) There is an interesting article from broadcastvideo.com suggesting head cleaning every 20 hours (!) but that may be pro broadcast equipment, and it appears to date from 1995, before MiniDV existed. On a related note, several people have reported that their TRV900 has damaged tapes by crinkling them. I have a page describing this problem and its solutions. You may find Alexander Ibrahim's DV Tape FAQ informative. OTHER CAMERAS: I consider the Sony VX2000 to be the "next level up" from the TRV900, and I have a bit more info here. The VX1000 user forum despite the name, is now mostly about the VX2000. On the higher-priced end is the Canon XL1 and XL1S with a great user page here. The PD100A uses a different tape format, comes with more accessories and is a different color, but is otherwise very similar to TRV900). On the less-expensive side, JVC makes a single-chip progressive-scan camera, the JVC GR-DVL9000 and you can see sample still frames (from the PAL version) here. The DVL9000 was replaced by the mostly-similar DVL9500. Here are some pictures from the DVL9600 (European model 9500 with DV-in enabled). Similar but more recent is the DVL9800U model, Walter Starck wrote a review of the PAL model. The Sony DCR-TRV10 has replaced the TRV9, and John Gayman put up some TRV10 stills. Now, the TRV11 has replaced the TRV10. Philip Williams has a user page about the compact 1-CCD Canon Elura. Sony announced the DCR PC100 in August 1999, a 1-CCD compact MiniDV plus megapixel digital still camera, reviews at imaging-resource.com and at steves-digicams.com, PC100 user page from Keoni Ahlo and Gregg. Less expensive is Sony's Digital 8 line, I put a few stills here. Sony's "second generation" Digital8 cameras all have 460k gross, 290k active pixel CCDs and 25x optical zoom, and the top DCR-TRV820 model even has a built-in printer. If you're curious about the Panasonic AG-EZ30 (small three-chip DV in a similar price range as TRV900) see the user sites by Enrique or Hugues. For still digital photography, be sure to visit imaging-resource.com. The Canon GL1 (in the same price class as the TRV900) has some nice features. I got one and made my own GL1 page. 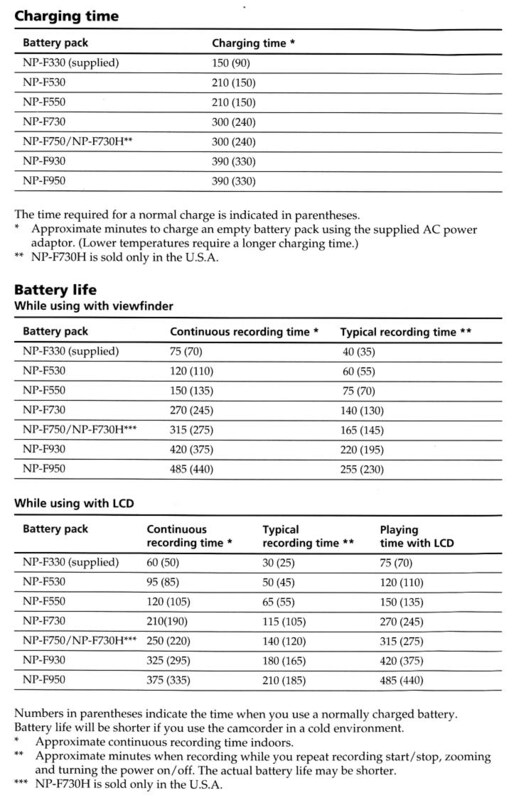 The Panasonic PV-DV950 has some specs similar to the TRV900, I wrote some notes about it. It has been replaced by the PV-DV951. The Sony DCM-M1 is the only disc-based consumer camera; it can record up to 20 minutes of video, claiming 400 lines of resolution (similar to TRV10?). Panasonic announced on 9/14/00 the NV-MX3000 3-CCD camera, which is available now in Japan (US$2,100). The Hitachi DZ-MV100 DVD-RAM Camcorder and DV-RX2000 DVD-RAM video recorder use discs rather than tape. The Sony VX2000 and PD150 cameras went on sale in May 2000, and I have a separate page about them. The 1CCD megapixel TRV20 looks like a TRV9/10/11, but has higher still resolution, like the PC100. Kamen Nickolov has a TRV20 webpage. The DCR-TRV30 seems to be similar to the TRV20. Susan Thrasher has a TRV30 website. There is a website in Japan which has some TRV30 frames and TRV900 frames if you want to compare. The DCR-PC5 is a compact 1-CCD slightly smaller than PC100, Tim Spracklen wrote a review. The Elura2 and Elura2MC from Canon are even more compact; I wrote a Elura 2mc review. I hear the shoulder-mount, 5-pound Panasonic AG-DVC10 is basically the AG-EZ30U in a new package. The JVC JY-VS200U is a compact single-CCD camera aimed at the pro market. For a more professional (and expensive) interchangable-lens camera, check out the JVC GY-DV500U, review at videouniversity.com and dv.com. Scott McClure wrote a DV500 FAQ. In a similar price class is the Panasonic AJ-D215 DVCPRO model. The Panasonic AG-DVC200 uses a full-size DV tape. The top-end MiniDV camera currently on the market is the GY-DV700 from the JVC Pro division, which has true 16:9 CCDs for widescreen acquisition, listed at ggvideo.com for under $10,000 including lens. HIGH END There's always something better... the best video cameras I know of are the Sony HDW-700A High Definition Camcorder (2 Mpixels per chip: 1920x1080i resolution, 140 Mbps data rate), and the more recent Sony "CineAlta" HDW-F900 (US$103,000 list). Here is a review of the HDW-F900 at videography.com. The HD cameras are claimed (by Sony) to be as good as 35mm movie film. You can actually rent one with lens, batteries, and tripod for a mere $1200.00 (per day). George Lucas is using the F900 camera to produce the next "Star Wars" feature, according to this press release. Panasonic also makes a 24p HD camera, the AJ-HDC27. OTHER DV RESOURCES AND FORUMS Adam Wilt has the most comprehensive site for DV technical information I've seen, at adamwilt.com. Peter Utz has written a professional video reference manual, and has many great articles on equipment setup and operation for review. This site has good low-level technical detail on the DV format. Christopher Spry has a very useful collection of links for DV cameras and editing equipment. 2-pop.com has good DV info especially for Mac and Final Cut Pro users. If your're planning a multi-camera shoot with live switching, Fred Wilharm's site can help. Global-DVC.org is a DV news/reviews site in Europe. 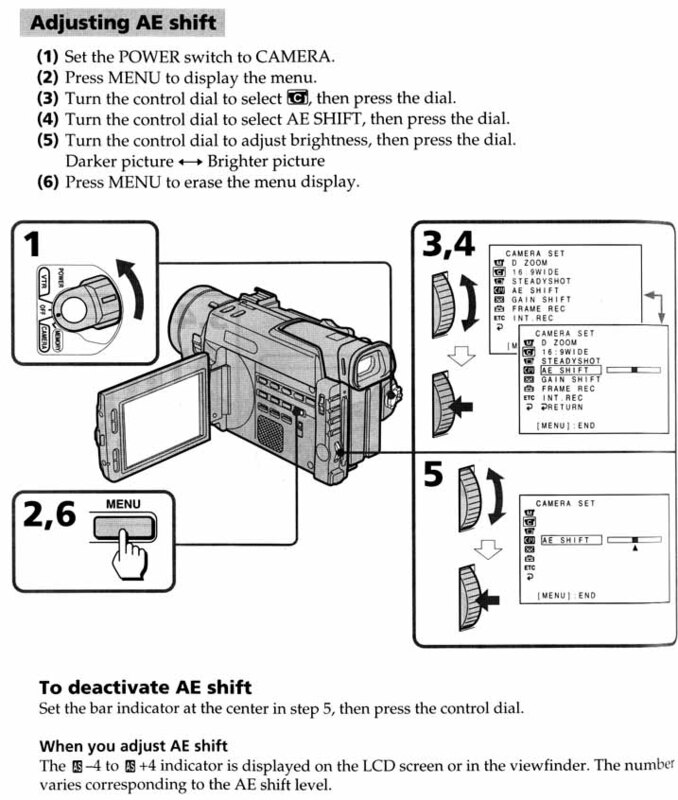 Javier Echarte has put up a Spanish-language page about DV camcorders. Chris Reijnen started the mailing list for the TRV900. VideoUniversity.com has several interesting video forums as well as very good tips and techniques. There are forums on many video topics at 2-pop.com and also Creative Cow. DVCreators.net offers workshops on video production. Too useful to miss... use NTSC color bars to properly setup your TV/monitor. VIDEO MAGAZINES Videomaker is the main magazine for video hobbyists in the US, with frequent articles on new consumer camcorders and advice for beginning and intermediate videographers. DV Magazine focuses on DV cameras (and higher-end gear) used by event and commercial shooters, with a lot of useful articles. Video Systems is aimed at the pro video market and has some interesting articles online. Videography covers professional broadcast and commercial video production, with an emphasis on high-definition (HD) equipment and other high-end gear. Not a magazine, but the TV Cameraman website oriented to the pro camera operator, has some good stuff, including the useful "tips and tricks" and amusing "screw ups" sections. MOVIE PRODUCTION There is a wealth of professional-level video production information at cybercollege.com. The DV Filmmaker site looks very interesting. Victor Khong describes DV production firsthand, using the TRV900 among others. Next Wave Films has an interesting section on ultra-low budget production (mostly film, not video). More good info at Greg Pak's filmhelp.com. There are some good micro-budget production notes and links at unhollywood.com. There is an archive of cinematography discussions that I found fascinating reading, about film but in many cases (lighting etc.) relevant to video also. 24fps.com has many good articles about cinemetography, sound, etc. relevant to film, DV and HDTV. RonDexter.com has a treasure trove of cinematography techniques and do-it-yourself grip hardware. volksmovie.com has a great collection of tips and tricks as well. If you want to know how the big-budget Hollywood movie effects are done, check out cinefex.com. Equipment Emporium has a great collection of practical advice on production sound. The Shure website has some audio advice and techniques. Don't miss Sven Carlsson's invaluable page on film sound design. Jay Rose has a lot of pro audio info at dplay.com, including an index of his column (since 1996, they have a huge amount of info) in Digital Video magazine. To buy all kinds of production equipment and supplies visit studiodepot.com . If you are in the SF Bay Area, you may be interested in the Bay Area Video Coalition. Beyond the Garden Gate was shot mostly with a TRV900, with some TRV9 footage. Some of the sequences I found very impressive and inspiring for filming my own nature subjects- the hummingbird and the insects are great. Breathing Space is a sci-fi short shot with the TRV900 and Panasonic DX110. YOUR EMAIL It's quite possible that other people would also be interested in the question you may have, so I encourage you to put it in my Video Forum rather than sending it to me via email. I'll try to answer any questions for which I can be helpful.